Today in Literacy we have been learning about formal and informal language and the reason why journalists use formal language. This is going to help us when we come to writing our recount. Below is an article which I would like you to read and understand. I would like you to identify the formal language and make a list of words/phrases on the blog. Tell me what the word means and the informal version of it. Also how does this make you feel? For example (from another article) : the writer has used the word Endeavour which is a formal way of saying to try hard. This makes me feel this person is determined to succeed. I would like everyone to have a go. Extra table points to Gain….. This entry was posted in Class 6 Red Blog 17-18, Class 6 White Blog 17-18. Bookmark the permalink. It was set out clear. .Rescue crews-These are basically people who risk there lives to save the lives of others. These two words make me think that the thing that has happened is very serious and people need to be aware of it. These words tell me when the incident happened and in this case it happened last night. .Resident-Someone who lives in the area. This word tells me that most people who live there are still alive. .The informal version of rescue crews is rescue people. .The informal version of last night is a few days ago. .The informal version of resident is someone who lives there. Swept means blown away like it’s been tipped over and this tells me that the train has caused damage and maybe injuries and the informal way is blown away.Possesion is the formal way for own and it means like when keep something like you have Possesion of the ball. Undamaged possessions : This means any unbroken close items. Unbroken close items is informal but undamaged possessions is formal. The reader is curious and wants to know what items weren’t damaged. Local resident: This means a friend which lives close to you. The formal way of saying it is local resident but informal it can be neighbour. The reader feel interested into what the resident is going to say so they carry on reading. Evacuated: This means left somewhere. Left is the informal way of saying it but evacuated is the formal way of saying it. The reader feels inquisitive and wants to know what has been evacuated. the author does not want to use slang because then the reader will not think that the author has put any effort in it but when you put formal language it makes you think that the author has put a lot of effort. This is a formal word for ‘own’.This means you keep something, so you have possession of something.You would use possession if you were talking to your Boss or someone like that. This is a formal word for ‘get away’ or ‘clear’.This means you are getting away from something bad and not get near it.When you evacuate, you try to get somewhere safe. This is a formal word for ‘danger’ or ‘damage’.This means when something is really bad and is in a highly destructive way. This is formal because you would use that word In a piece of text similar to this one.Also It is not an slag word.The informal way of saying this word is people. This is a formal word because you don’t want to use slang in a news report so the informal word to resident would be person. This is formal because instead of saying broken it wouldn’t be very formal whereas saying undamagedis very formal. This is formal and opposite of evacuated would be informal and we can not use that in a newspaper article if a informal word was in quote then we could use it because it is in a quote . This an informal word and the formal way of saying it is fire engine or fire fighter.Fire brigade is an organisation that works to prevent unwanted fires and to stop them from burning.When I saw the word fire brigade in the sentence I felt that why did they need the fire brigade. This is a informal word.I think the formal word of this is people.Resident means a person who lives or has their home in a place.When I read this word I starting to think that a qoute was coming up. This is a formal word as the opposit of the world is left.It is also formal because if is posh.The meaning of evacuation is to leave and to evacuate feels that they are in danger and want to leave. This is formal as its is also posh.this word means people of the house.In this article the word residence would be telling us who was effected. it is telling how it was crushed. 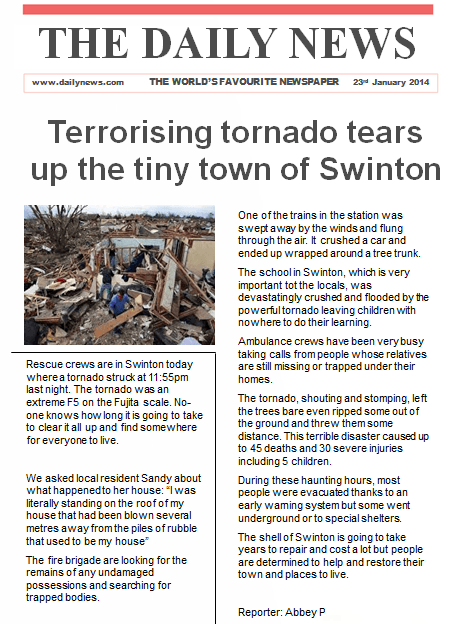 this is a powerful tornado in Swinton. This is formal and the informal way of saying this word is neighbour. The impact that this has on the viewer who is either reading or swiping is probably thinking what has the local resident here to say and what is their opinion on what happened in the tornado when she was watching. This is formal because it makes the reader more valued and want to read more on to the news report the informal way that you would say this word is not wrecked and this does not have much effect on the reader. The impact on the formal saying would probably make the reader think a lot more about what’s undamaged. The words in the text for undamaged possession. This is a informal way of using a word because it will not bs broken to their belongings.I feel that the the writer has used informal language.Is trying to make it look as if there is still hops to find these possessions. This is a formal language phrase and the informal version would be: The tornado which is shouting and stomping. This is a formal language phrase and the informal language would be:During all these haunting hours lots of people were evacuated.